A capture card is an indispensable part of a streamer’s arsenal, especially when it comes to console games. And while software such as XSplit allows you to record and stream in-game footage without requiring any extra hardware, using such software usually results in a noticeable performance drop. Now, a capture card will allow you to record gameplay on the PC with no performance hit and when it comes to consoles, they will allow you to easily capture and transfer any gameplay footage to the PC with minimal effort. Today, we’re bringing you a selection of several of the very best capture cards available in 2019! Elgato is a seasoned German company that has been around since 1992, and during that time, they have excelled in producing a variety of electronics and software. Today, capture cards are perhaps what they’re best known for, and the HD60S is definitely a popular product. 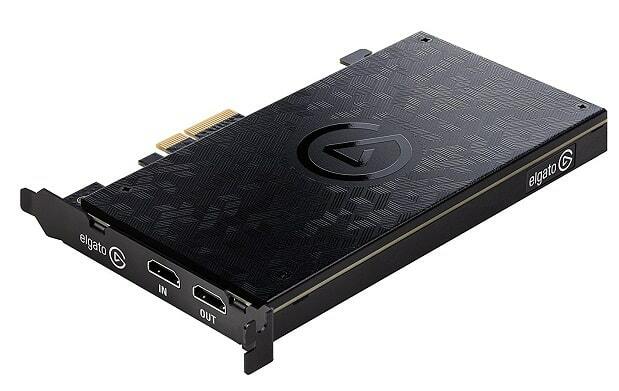 Coming in the form of an inconspicuous black box with rounded edges, the HD60S can easily be plugged into your PC, console, or TV, and it is among the more affordable capture cards listed here. First and foremost, the HD60S can stream in 1080p at 60 FPS, and with a maximum bitrate of 40 Mbps, which is likely to be more than enough for most users today. It comes with a USB 3.0 port, using a USB-C type connector. And in addition to the HDMI ports, it also comes with a single analog audio jack. 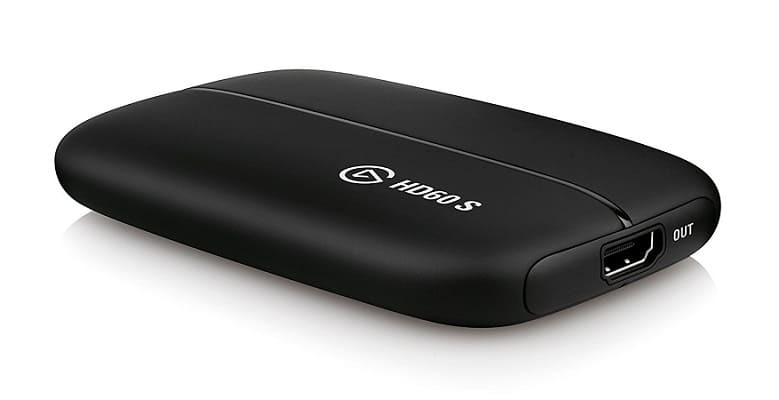 The HD60S further facilitates streaming with the help of Elgato’s software which makes editing easier and it also allows you to stream effortlessly to a number of sites, including YouTube and Twitch among others. On the downside, while it is quite handy, the aforementioned software is a bit limited, so if you need to do any serious video editing, you’ll probably need something better than what Elgato’s stock software can offer. Next up, we have another Elgato capture card, and it’s a more serious capture card – the HD60 Pro. As can be seen from the picture above, it differs from the HD60S in that it is an internal capture card that interfaces via PCIe. It sports a sleek black and dark grey metal exterior becoming of its name, and it shares some features with other HD60 capture cards but also has a couple of extra tricks. In regard to the video quality, the HD60 Pro actually doesn’t differ much from the HD60S, as it is capable of streaming in 1080p at 60 FPS. It does, however, support a higher maximum bitrate of 60 Mbps, though this isn’t as big of a difference. Now, what makes this capture card special is the onboard H.264 encoding that allows for high-quality video compression on the fly, and with almost no visible loss in video quality. What this means is less strain on the hardware and less space taken up by game footage. On top of that, the HD60 Pro comes with the same software as the HD60S, allowing easy streaming and some basic editing. 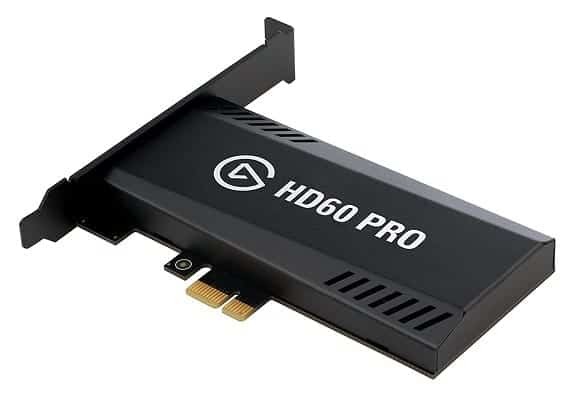 Now, the obvious issue with the HD60 Pro is that you will need to use it with a PC due to it being a PCIe capture card. Because of this, it cannot be used with a laptop. And for the final capture card from Elgato, we have their most powerful product yet: the Elgato Game Capture 4K60 Pro. Like the HD60 Pro, it is an internal capture card that interfaces via PCIe, and it sports a great-looking patterned exterior. However, the performance is far more impressive than the design in this case. As you may have guessed, what makes the 4K60 stand out is right there in the name – it can stream and record 4K footage in 60 FPS, and it is the first capture card capable of doing so, at a bitrate of up to 140 Mbps. As such, it is in a league of its own, and is very future-proof. Sadly, it doesn’t have built-in H.264 encoding like the HD60 Pro, although the software is still all there. Now, seeing as this is the first 4K capture card and is one of the few available at the moment, the key issue with it is the price. Needless to say, only the most serious streamers will be able to afford it, since the price tag hardly makes it an appealing product for the average gamer. Furthermore, the 4K60 Pro requires some serious horsepower on the hardware front, especially when it comes to the CPU. As stated on the official product page, Elgato recommends a 6th generation i7 or a Ryzen 7 or better, along with a GTX 10-series or RX Vega-series GPU. 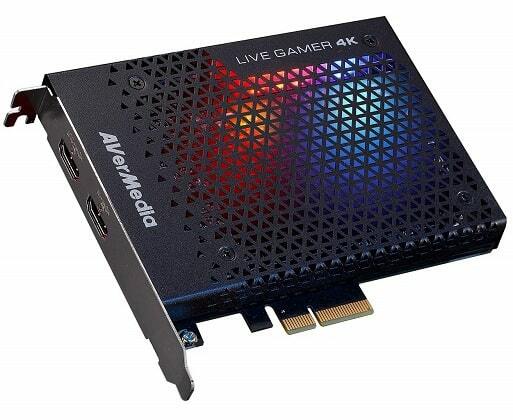 The next capture card on the list comes from another company called AVerMedia, and it’s their Live Gamer 4K capture card. As the name suggests, this is also a 4K capture card, although it differs in some respects from the above Elgato model. Like the above capture card from Elgato, the Live Gamer 4K can capture 4K footage in 60 FPS (or higher, at lower resolutions) but on top of that, it also comes with HDR recording capabilities. What’s more, the card itself also comes with RGB lighting which complements the design very nicely. AVerMedia delivers on the software front as well, their RECentral 4 software suite providing everything from drivers to video editing. In practice, it’s not quite as stable as Elgato’s software, but it gets the job done. As icing on the cake, the CyberLink PowerDirector 15 comes bundled with the capture card and though it may not be as powerful as, say, Adobe Premiere, it is still a very good program for video editing. 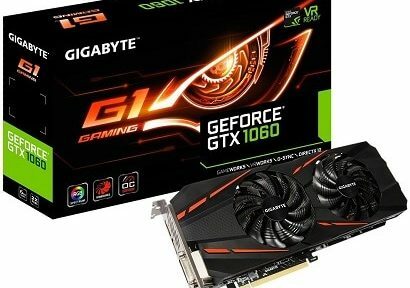 But ultimately, the same issues remain with this card: it is quite expensive and requires powerful hardware to run, which is no wonder considering just how demanding a resolution 4K is. Cloner Alliance is a relatively young company, founded only recently in 2014, and their inventory includes several video-focused hardware and software solutions. The product of theirs that we’ll be taking a look at here is the HDML-Cloner Box Pro. As far as outward appearance is concerned, this product looks more like a set-top box than a capture card – it even comes with its own remote! It is a standalone device that doesn’t need to be connected to a PC in order to function, so it would make a good fit for many a console gamer. The HDML-Cloner Box Pro can record 1080p video in 60 FPS, outputting it as an H.264-encoded MP4 file. However, even though it is a standalone device, it doesn’t come with any built-in memory and it has to rely on external storage such as flash drive, an external HDD, or an external SSD. As for the software, the product comes with Cloner Alliance’s own free editing software. Needless to say, it is a highly basic program, so if you want to do any serious editing apart from trimming or splitting videos, you’ll need something more powerful. 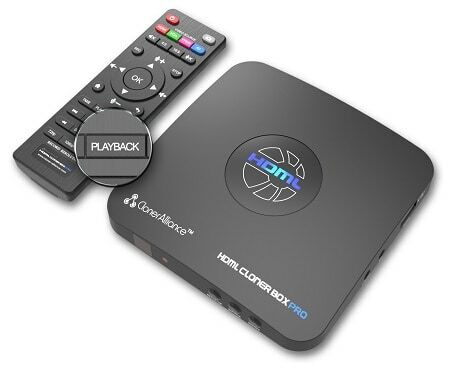 Overall, the HDML-Cloner Box Pro does what it was designed to do, though it can reportedly be a bit of a hassle to set up and the firmware may need to be updated manually via PC. But apart from that, it’s a solid product if you need a standalone device to record gameplay footage or TV content, though some of the other capture cards listed here would undoubtedly be a better fit if you need high-quality video and seamless streaming. There are obvious advantages and disadvantages to both of these categories. In essence, internal capture cards connect to the motherboard via a PCIe slot and thus ensure the fastest connection but are not portable and can only be used with desktops, for obvious reasons. On the other hand, external capture cards are a bit slower but they make up for that through portability. If all the devices you intend to be recording, streaming from can easily be connected to your desktop PC, then an internal capture card is probably the best choice. If that is not the case or if you use a laptop for video editing, then you will definitely need the portability of an external capture card. As such, make sure to check your upload speed with SpeedTest. No point in getting an expensive capture card for streaming if your bandwidth can’t handle its part. Furthermore, if you use a WiFi connection and you feel like you’re supposed to get better download and upload speeds, then check out our guide on the best WiFi extenders as these will help you get a better wireless connection if your router is far away from your computer. 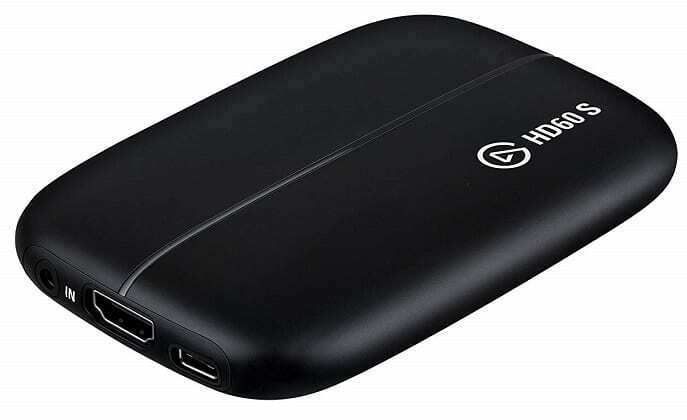 If we had to go with one of the products listed here, we’d pick the Elgato Game Capture HD60S. Why? Well, simply because we find it to be the most versatile product on the list, but it also offers great value for most people. True, it lacks some features of the HD60 Pro and it cannot capture 4K footage like the 4K60 Pro or the Live Gamer 4K, but 4K gaming isn’t quite here yet anyway, and neither is 4K streaming. This capture card can work with any PC or console, it is highly portable, and it doesn’t cost much to boot – relatively speaking, of course. Still, any of the capture cards listed here would be a good purchase provided that you keep your needs and their capabilities in mind, but we feel that the HD60S would be the best fit for most people.